28 | Celano/Andrada/Baggiani. L’ecole. Córdoba. 5 | Jodos/Celano/Baggiani. Virasoro Trasnoche. Cdad. de Buenos Aires. Michael Moore, Joachim Badenhorst and Natalio Sued on Reeds, Clemens van der Feen on double bass, Marcos Baggiani on drums and me. “Erasing Borders, seven Celano compositions reflecting the human and ecological consequences of our lifestyle. Unlike obvious musical propagandists like Phil Ochs or Frederic Rzewski, Celano doesn’t use lyrics or melodrama to make his point. Instead his writing is concerned with nuance and suggestion”. 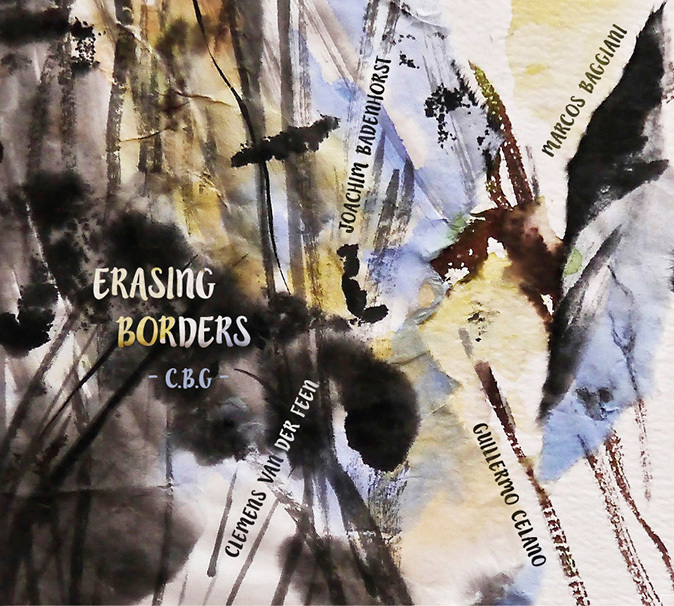 “Erasing Borders is C.B.G.’s fifth album, and testament to their maturity as a unit”…. Dalston Sound, Tim Owen, United Kingdom, july 2015. This is jazz today, sept 2015, USA. Dave Sumner. Guitarist Guillermo Celano is the winner of the North Sea Jazz composition assingment 2013.
and with Clemens van der Feen on double bass.